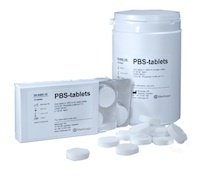 Medicago’s PBS is specifically developed for immunological and microbiological laboratories. It is provided as pre-weighed tablets in containers and in convenient blister packs, or as pre-weighed powder mix in sealed pouches. There are seventeen standard-sized packages and final volumes range from 100 ml to 100 litres. Choose from different pH, 7.2 and 7.4 and from PBS with or without potassium. PBS without potassium is available in two different molar strengths, 0.01 M and 0.02 M. PBS solution is supplied as a ready-to-use solution. Empty one pouch or deposit one tablet in a laboratory flask or beaker placed on a magnetic stirrer. Add 50 ml to 500 ml of deionized water for pouches and tablets in the volume range 100 ml to 1000 ml and stir the solution for a few minutes. Adjust the water up to the given volume, stir until full dissolution and the buffer is ready to use. For larger quantities, 10 to 100 litres of buffer, use suitable equipment to stir and dissolve the buffer in compliance with the instructions above. PBS buffer is shipped at room temperature. Store the tablets and pouches in a dry place at room temperature. Shelf life is three years after production date.. Medicago’s ready-to-use PBS solution in bottles is stable for one year at +4°C.